"Sit. Feast on your life." 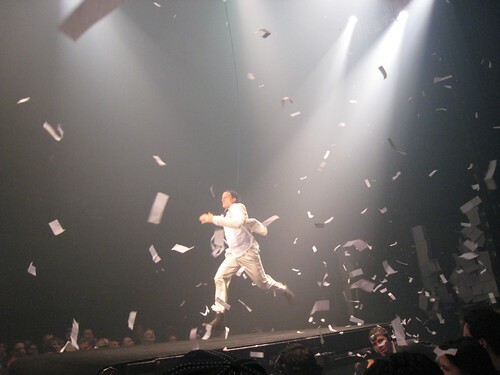 The show Fuerzabruta—which RZ had scored free tickets to—confused us, amazed us, covered us in paper shreds and joyous rain, and afterwards we were ready to grub. She and I settled on Friend House II nearby, a slick, pink-hued restaurant I pegged as another joint in the vein of Kaleidoscope, a place serving a hit parade of Asian food with none executed well. 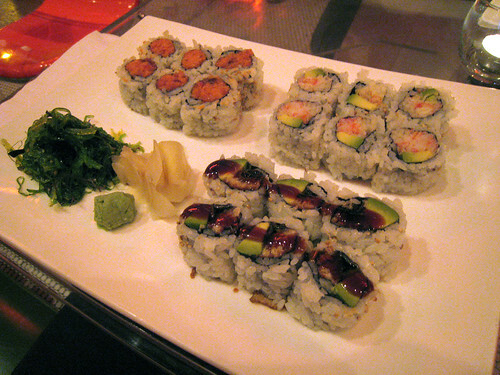 Since I wasn't expecting much, I wasn't fazed by the standard fillings and stiff rice of my eel-and-avocado, California, and spicy tuna combo; the rolls were adequate. What did surprise me was that RZ's pad thai was decent. I wouldn't call it the best and it certainly wasn't authentic, but nonetheless I liked it because the noodles weren't wet and gloppy, the flavoring wasn't overly sweet, and because the dish was studded with thick chunks of super tender chicken. I suppose it's a bit strange that I'm celebrating these noodles more for what they're not than what they are, but in the face of NYC's pathetic pad thai situation, anything better than bad is "good." The hunt goes on.